I'll try find some pics to scan.And yes, it was ORANGE! Sheet, must check my other drives, must have wiped the ultimate Yamaha DT 175. Will find it later. "Larger Carb" skimmed 1.5mm ish out of the bore of the stocker. Longer swing arm , stupid mod totaly wrong, read too much Cycle world desert racer write ups. Increased suspension travel, by reducing overlap, bad mod. Removed oil pump for just pre mix. Modified air box to higher inlet etc. (All done as a "school kid 16 to 18 years old" no old man, worked in a cinema at night and bought second hand MX tyres, had no finger tips due to worked on building sites throwing bricks for beer and bike bits whilst doing "A" Levels" in Pure Maths, Applied Maths and Physics). Got a couple of Silvers in Enduro,s though . Ah, found da pics again! Sorry about the quality. Another bike my dad had on the farm was one like this TC 125 Prospector. 8 Gears, yes 8. 4 Hi range and 4 low range. Was a very nice bike for the farm. 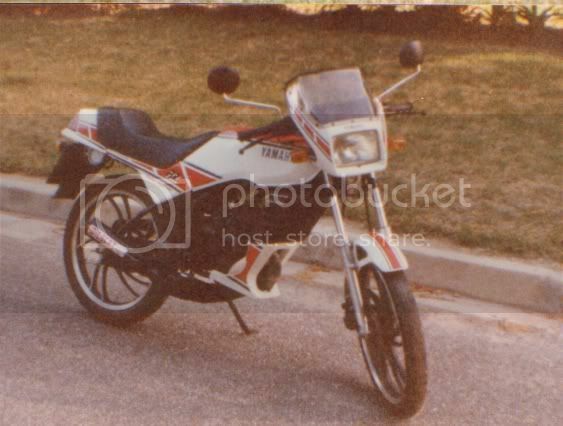 My first bike was a Honda XL185. My dad bought it 2nd hand for the farm. After I fell that Kapoet I (or the farm) got a Yamaha IT175. PS. How do I get the quality of the photo's better? I've scanned at a higher res and in BMP, but photobucket resaves to JPG and then it looks like this? PSS. OK. The pics are fine even in photobucket. When it shows up here its buggered. Admin? I wondered the other day if someone remembered them, Would love to lay my hands on one!! (project bike.. I was thinking the same thing when I did the research for a pic, Tontel*. Would be a lovely project bike. Edit: Just remembered, that thing had a mean compression kickback. not lekker when you can barley hold it upright and kick it with "kaalvoete"
My previous bike was a BMW650GS there are some awsome moments with her until 11/09/2002 she died and I stayed behind. Is dit olie of water onder die GS, Gideon? We (friends) had a Suzi TS 85? it was small but disc valve a real wheelie king. I was 13 at the time and it was a powerful bike too me back then. Those were lekker bikes. Had some timing chain issue/problem? 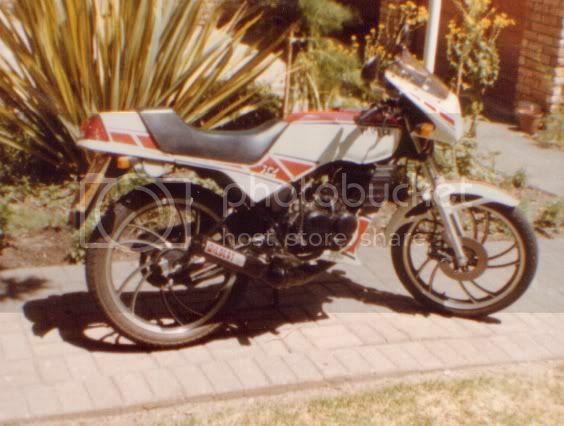 Our neighbour's son had a blue one, I was pillion often, with my brother on my dads TF125. This are I, 1974. Being an arse. Nothings changed in 33 years, did that yesterday evening in the garden on the xchallenge, grass did not like the knobblies. That must have been a KTM disguised as a yammie, how's that grin. 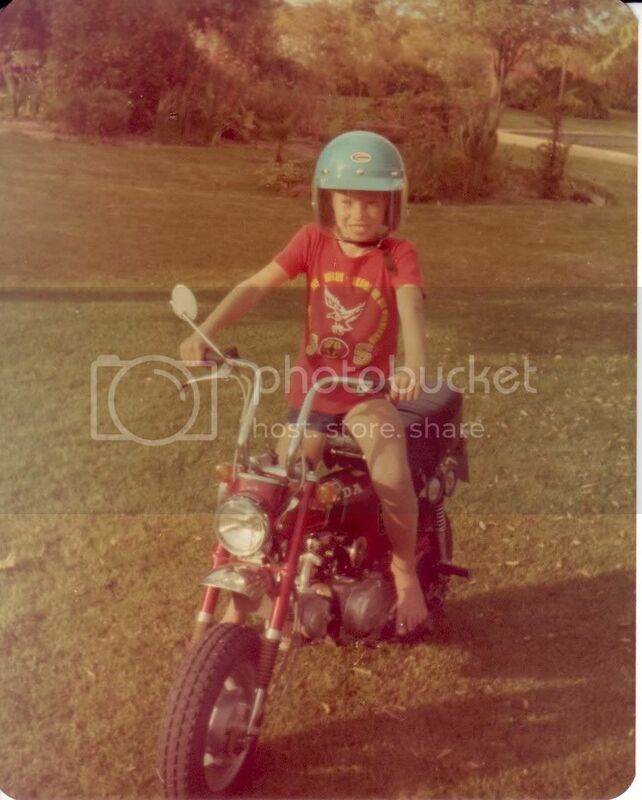 Circa 1975, about 7years old, Honda 80. Awesome little bike. No clutch. had my dad's whole farm to play on. Memories. Hey Ama that does bring back memories. I learnt to ride on a Yamaha Chappy which looked very similar. Wish I had soem photos......but this does bring back memories!! Do scooters count? 1983 Vespa PX 200E. I've wheelied her more often than my KLR! I've added a few more bling bits and pieces recently: a super chrome front rack for my planned trip down the coast Any fellow Mods interested in joining me? !